Lemon Madeleine’s are a classic French treat and make a perfect gift for mum on Mother’s Day. They are sweet, gently crisp on the outside, light and delicious and best served warm with home-made lemon curd. Whisk eggs, sugar and lemon zest until frothy. Melt butter and add lemon juice then slowly mix all ingredients to the egg mixture. Brush the madeleine tray lightly with melted butter and then coat in flour. Leave your mixture to rest for 20 minutes then pipe into your prepared madeleine moulds and cook for 10 minutes on 180°C. These lovely Madeleines call for being dipped in home-made lemon curd and, it’s something that is never the same when shop-bought. Now whisk continuously using a balloon whisk until the mixture thickens – about 7-8 minutes. Next, lower the heat to its minimum setting and let the curd gently simmer for a further minute, continuing to whisk. After that, remove it from the heat. Now pour the lemon curd into hot, sterilised jars, filling them as full as possible, cover straightaway with waxed discs, seal while it is still hot and label when it is cold. 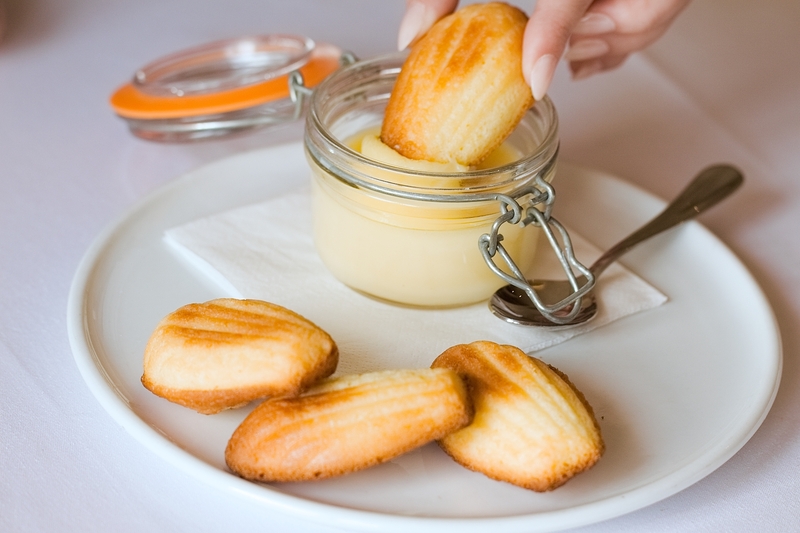 These lovely Madeleine’s are available on our menu in Hart’s Kitchen. Pop in and try them soon. To purchase gift vouchers call our friendly team on 0115 988 1900.